The body of the fourth person killed in last week’s Miami parking garage collapse was removed from the rubble and family members identified him as electrician Robert Budhoo. 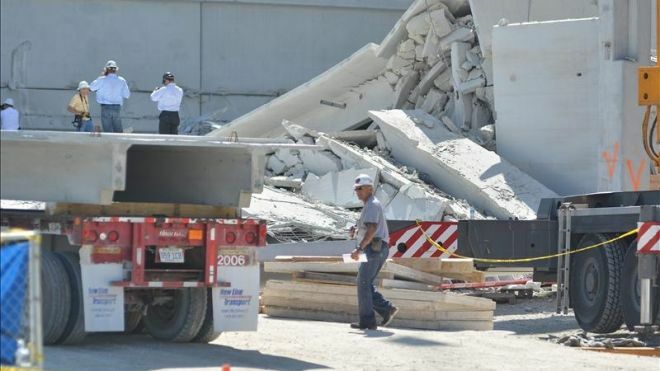 The 53-year-old victim had been missing since the Oct. 10 collapse of one section of the garage, which had been under construction at Miami-Dade College’s west campus in the suburb of Doral. His body was located under the rubble on Monday, but police had said it could take several days to be removed due to the unstable debris. It was finally removed Thursday and the attorney for Budhoo’s relatives told local media that authorities had notified them. The family called on the media to respect their privacy at this time and thanked authorities for their efforts to recover the body, the attorney said. The other three victims were identified as 48-year-old Carlos Hurtado de Mendoza, 60-year-old Jose Calderon and 53-year-old Samuel Perez. No students were in the parking garage at the time of the collapse. At least seven construction workers were taken to nearby hospitals with various injuries, while eight others were treated on-site before being sent home.